A few days ago I made a return trip to Piers Park in East Boston. 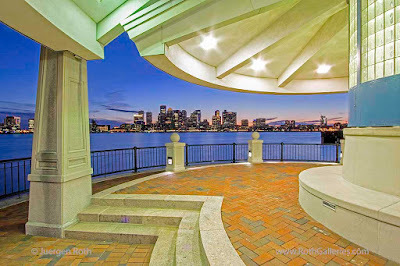 This park is one of the Best Boston Photo Location as it provides pristine views of the Boston skyline and its harbor. It is always fun to just chill and watch the boats come and go; it is also a great place to watch the people stop by and enjoying the view of the city. 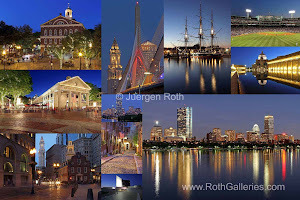 I come here quite often to photograph the skyline or create beautiful Boston panorama photography images at dawn or dusk. I often thought to incorporate the pavilion into one of my composition but have not done so yet. This all changed on my last excursion. 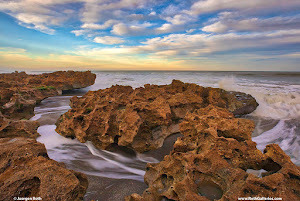 I arrived early and had some time to explore different perspectives. I finally found one that showed promise. After photographing the city I noticed that the other photographers already left and I took advantage of this opportunity. I used the architecture of the pavilion to lead into the composition and frame the city. The light was still brilliant and I metered on the skyline. I captured 3 images at various exposures that I later combined in photoshop to create a stunning East Boston Piers Park View of Boston. Bass Harbor Head Light - One of the most Scenic Lighthouses in the USA? Bass Harbor Head Light is a picturesque lighthouse located within the boundaries of Maine Acadia National Park on the southeast corner of Mount Desert Island (MDI). This scenic lighthouse beautifully towers over the swirling Atlantic Ocean and granite seacoast, marking the entrance for ships to Bass Harbor and Blue Hill Bay. 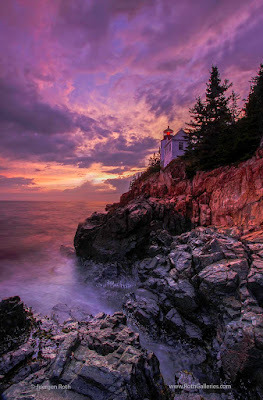 It is one of the most iconic scenery of Acadia National Park as Bass Harbor Light is dramatically located on the edge of rugged cliffs. For this Bass Harbor lighthouse picture I opted for a long exposure photography setting to render the incoming waves into a silky water effect; conveying a sense of moving Atlantic Ocean waters pounding the Maine Seacoast. A graduated neutral density filter balanced the bright sunset light in the sky and clouds against the dark foreground of the granite cliffs. 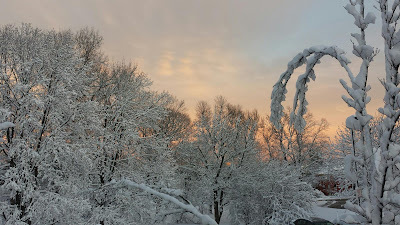 Last week we were blessed with an amazing snowstorm. It snowed all day long and the snow was wet sticking beautifully to anything and everything. Ones the snow stopped late afternoon the gray overcast sky opened up just in time for a gorgeous sunset. Clouds were painted in beautiful orange hues and the sky turned into a clear blue within minutes. There was not much time to capture this stunning moment and in an instant I decided to pull out my camera gear and got to work immediately. The light didn't disappoint allowing me to capture one of my most memorable winter wonderland photography images: A Sunset to Remember. 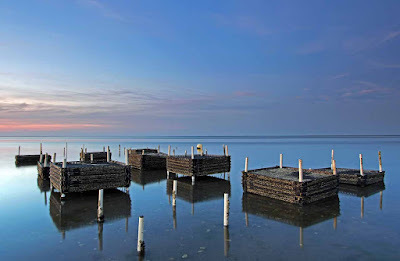 My Cape Cod fine art photography image Cape Cod Oyster Farm has been selected to be part of the Cape Cod Art Association's 2016 exhibit “Artists Choice”. 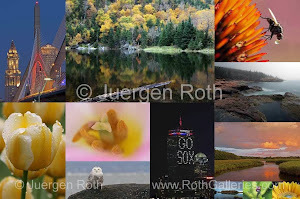 The exhibition features a selected number of artists including my beautifully framed photography fine art print from my New England and Cape Cod galleries. All artwork is for sale. 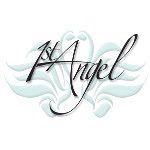 The art exhibit is organized by the Cape Cod Art Association and runs from February 15, 2016 through March 13, 2016. Regular gallery hours: Monday through Saturday - 9AM until 4PM, Sunday 12PM until 4PM. 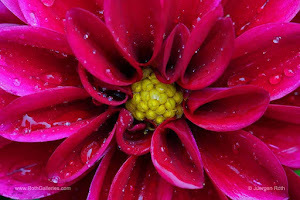 The beautifully galleries of the Cape Cod Art Association are located at: 3480 Route 6A, Barnstable, MA 02630.